Born and raised in a small farming community in Cache Valley Utah, I have lived and I am still living a life most only dream of. Many of my days were spent with my father, tagging along behind him, working the family dairy farm, irrigating the valley fields, and hunting the mountains above the Valley. I could ride a horse before I could walk and when I wasn’t riding them I was content just being with them. My second passion was drawing; hours were spent with pencil in hand expressing the love I had for the things around me. Any animal was considered a worthy subject and when I wasn’t drawing them I was studying their form, color and movement. I have the good fortune of being married to a man whose passion is photographing wildlife, we spend every moment we can together feeding our hunger for nature. I began working with oils in 2004 and have fallen in love with their vibrant, creamy color. I find that through oils I can make my paintings come to life. While my subject matter is mainly wildlife it has expanded to include Western genre as well. As a rule I will not paint something unless I have seen, researched and studied it myself. I see color in nature differently than most people, purples and blues in grasses, pinks, reds and greens in the ground and rocks. While traveling I don’t dare sleep for fear I will miss the scenery and color that is around the next bend. I don’t know of any words that describe the excitement I feel when I am in nature or viewing wildlife. Wanting a common thread, a trademark of sorts, in my work, I often include a bird or reference to a bird in each of my paintings. I see birds as a symbol of freedom and happiness. They are a common part of our everyday life. I admire their beauty and their ability to adapt to their surroundings. I have many feeders set up outside my window where literally hundreds of birds come each day to feed. Many times I am so intent on watching them that I forget I am supposed to be painting them. It is my hope that those who view my work will feel the peace I wish to convey in each painting, and will also recognize the passion I have for the subject matter. My entire life goes into my paintings, all that I have lived and felt. I can tell when a painting is complete when I have become part of it. If people are able to feel the same joy while looking at my work that I felt creating it for them, then I have accomplished what I set out to do. 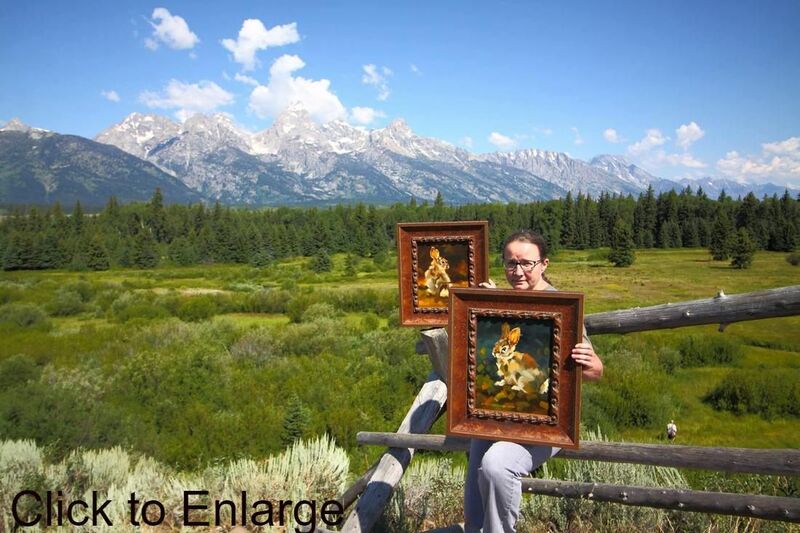 My paintings hang in many private collections and are found in galleries in Utah, Montana and Wyoming. I am grateful for the gift of art with which I have been blessed and I am grateful to live in an area where I am surrounded by the things I love.